Statue Of Cosimo Di Giovanni De Medici, Called The Elder And Posthumously Father Of The Fatherland Or Pater Patriae, A Famous Statesman And Banker, In The Uffizi Colonnade In Florence, Italy. Lizenzfreie Fotos, Bilder Und Stock Fotografie. Image 111725968. Standard-Bild - Statue of Cosimo di Giovanni de Medici, called the Elder and posthumously Father of the Fatherland or pater patriae, a famous statesman and banker, in the Uffizi Colonnade in Florence, Italy. 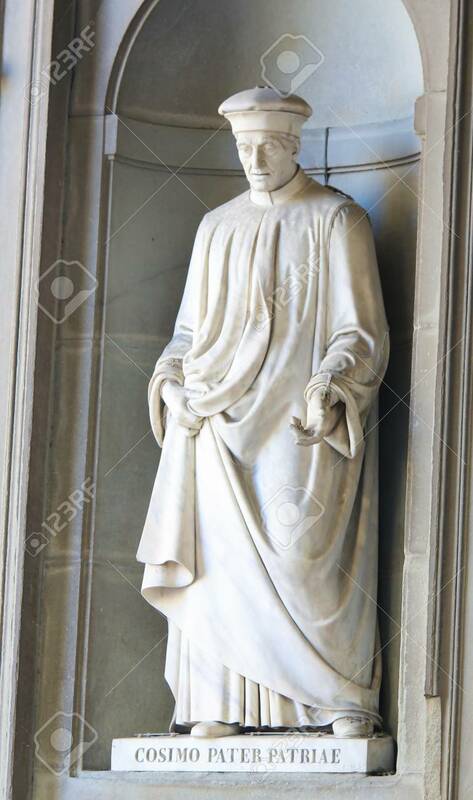 Statue of Cosimo di Giovanni de Medici, called the Elder and posthumously Father of the Fatherland or pater patriae, a famous statesman and banker, in the Uffizi Colonnade in Florence, Italy.